The former actress and now a blogger announced the sad story of her life today! 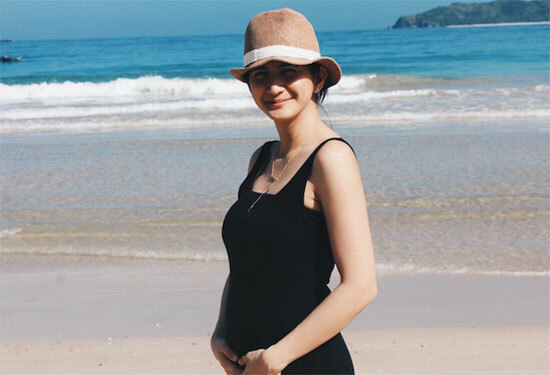 Rica Peralejo posted on her blog the sad news about her and the supposedly soon-to-be born baby. Rica suffered a miscarriage on Thursday, March 3. Peralejo wrote on her blog that she lost her 6-week-old baby. She was became pregnant in January this year but they found out that her baby has no longer heartbeat. The title of her article is "Pain and Peace," as she captioned her photo with, "It was good while it lasted, it was good even when it ended. God is good all the time." "One of my biggest fears has been realized…I lost the baby in my womb. For those who don’t know, I found out I was pregnant sometime in January, announced it last Sunday to the public, and on Tuesday found out that my baby no longer has a heartbeat. The long explanation for the cause is that it is most probably a developmental problem. An abnormality with the baby that is not compatible with life so it didn’t allow my baby to progress any further. My doctor said that nothing could have altered this, even if I rested, stayed home, etc. My first ultrasound showed heartbeat and my second didn’t anymore. The size of the baby also remained the same despite the 6-week-gap. Now that’s the long of it and here’s a short one: God gives and God takes away. I believe that there is nothing I could have done to keep the baby, or to lose the baby, if it isn’t aligned with God’s good, pleasing and perfect will. So many stories attest to this, like some moms who don’t want their babies and do everything to rid of them, still get to keep them no matter what. On the other hand, many fit women out there happen to miscarry or lose babies for unknown reasons. I actually know three women who have miscarried and lost a number of babies in their womb, all who are very dear to me, and they serve as inspiration and hope for me at this time. We’ll never understand it all, why this happened to them, to me, and not to others, but one thing enters my mind right now: God knows what he is doing. Basically, that’s the tension of pain and peace that I feel right now. I know the baby really is supposed to be where he or she really is, but I also long to be with him or her so much. As in so much. I think I have a long way to go to heal. Right now I can already feel fear seeping into my bones, traumatized by silent dopplers and all. That is something I know I’d have to deal with in the days to come. I am not sure if I will [publicly] write about it again, but I am doing what I can now to inform people who care. Many celebrated with us when we announced the “twin pregnancy” – of my sister and I getting pregnant at the same time. So I feel it is only apt to inform you guys of the sad news, to honor the joy you shared with me. (In other news, Paula is in great shape! She and her baby are doing just fine, praise God!)" Rica Peralejo was married to a Pastor named Joseph in year 2010. By then, Rica ended her career in showbiz and focus her life to her own family. You may read Rica's whole article on her official website here and give her thoughts and comments. Comments or suggestions about "Former actress suffers miscarriage" is important to us, you may share it by using the comment box below.